The death toll in southeast Africa from the storms, rain and flooding caused by Cyclone Idai is rising as rescue services struggle to reach isolated areas. In Mozambique, the death toll has risen to 446. In Zimbabwe and Malawi, the number of people who died is up to 259 and 56. Authorities and aid agencies fear more deaths amid a high risk of cholera and other water-borne diseases spreading through devastated areas. "It is inevitable that cases of cholera and malaria will arise," said Mozambique's Land Minister Celso Correia on Sunday. "In many areas we are already fighting with malaria cases." The flooding has created a 125-kilometer (78-mile) wide lake, devastating an area previously populated by hundreds of thousands of people. Speaking alongside Correia at a briefing in Beira, on the coast 1,000 kilometers (620 miles) north of Maputo, Sebastian Rhodes Stampa of the UN Office for the Coordination of Humanitarian Affairs warned that the outbreak of disease in inaccessible areas could be "really problematic." The World Food Programme said that the humanitarian disaster unfolding in Mozambique is on a par with the situation in Yemen and Syria. Ongoing rainfall and damage to major roads has made reaching those who were in the path of the cyclone ten days ago challenging. The International Federation of the Red Cross and Red Crescent Societies (IFRC) said the situation was worse than they had imagined and that humanitarian needs "will tragically only deepen in the coming weeks." Aid agencies are used to delivering aid by land but have been forced to use helicopters. However, there are only a few available — only India's and South Africa's military have provided them for search and rescue operations. 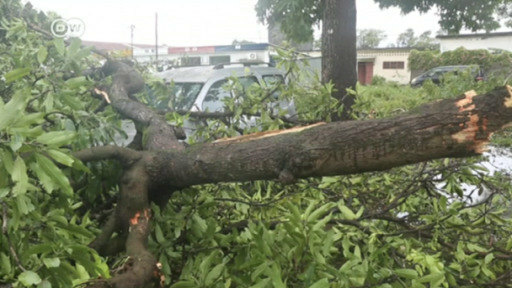 Efforts have been made to re-open the main access road to Beira, which saw the brunt of the storm when it made landfall. Many people who lost their homes are living in shelters around Beira. Others are still sheltering in what remains of their villages, unsure of where to go. Father Pedro held a mass at the Ponta Gea Catholic Cathedral in Beira on Saturday night. He said: "The people don't know what to do because they lost their houses, they have no food, they don't know where to sleep." Up to 110,000 people are staying in shelters. Germany has provided €1 million ($1.13 million) in emergency aid and is redirecting some of the €4.3 million already earmarked for humanitarian assistance in Southern Africa for 2019 to be used for the most urgent humanitarian needs. It is also promoting projects run by the German Red Cross. China's Ministry of Emergency Management said on Sunday it had deployed a 65-strong foreign aid team with 20 metric tons of emergency aid supplies. A similar amount is being sent from the UK, the defense secretary said on Sunday. The UK has already provided €25 million in aid and is helping with deliveries inside Mozambique. The Canadian government is to provide initial funding of up to $3.5 million in emergency assistance and donate relief supplies, including tarpaulins, shelter kits, mosquito nets and blankets. Other contributions have come from Japan, Belgium and Morocco. A new deadly storm hit northern Mozambique more than a month after Cyclone Idai ravaged the country. Homes were destroyed and power lines cut in the city of Pemba, with UN officials warning of "massive flooding." Another powerful cyclone has made landfall just over a month after Idai devastated the country. Cyclone Kenneth is now cutting its path of destruction, while residents seek refuge.